Assume an investor buys 100 shares of stock from a company that has 1,000 stock shares outstanding. They now own 10% of the company. The company, in turn, has money to grow by either hiring employees or buying equipment. As the company expands, and makes a profit, it will proportionately share that profit with investors through dividends. People invest in the companies they believe will grow and ultimately increase in value. When the company from the example above increases in value, the value of the 100 shares the investor bought also increases. Therefore, when the investor decides to sell the 100 shares, they will generate a profit, or capital gains on the sale. The investor can take those realized gains and invest them in a Qualified Opportunity Zone (QOZ) to help defer taxes. To do that, they place those gains into a certified Qualified Opportunity Fund (QOF). That fund, in turn, buys shares of stock in a QOZ Business. 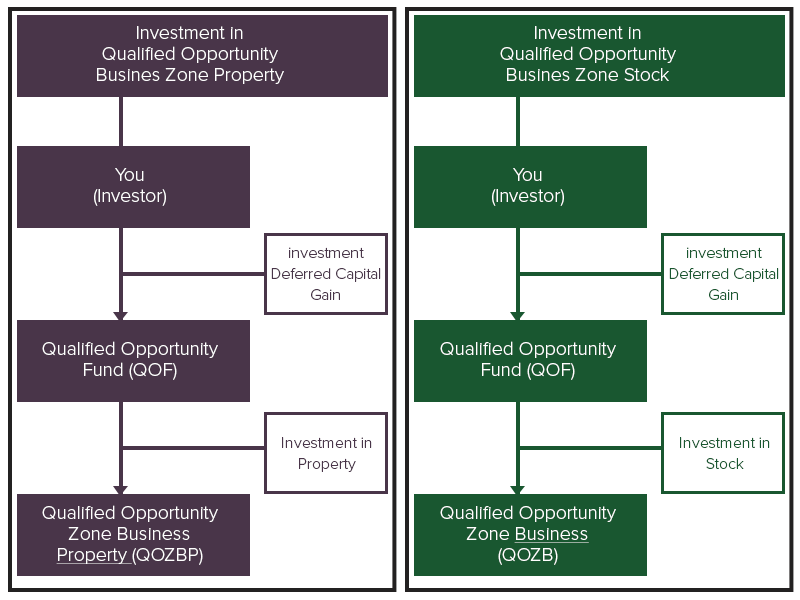 Qualified Opportunity Zone Stock, is one of the three designated asset types collectively called Qualified Opportunity Zone Property, in which a QOF can invest as illustrated in the chart below. A person’s investment in a QOF can be likened to a mutual fund investment, in which the fund buys stocks, bonds and other financial instruments. The fund manager’s goal is to select investments which will grow the fund’s value and consequently, the investment. Meanwhile, an investment in a QOF also yields an investor the reward unique to the QOZ program: defer tax on any prior gains and, if the investor holds the investment in the QOF for at least ten years, an increase in basis equal to the fair market value of the investment on the date that the investment is sold or exchanged. In other words, the investor would owe no capital gains tax on the QOF investment if held for ten years. What is the difference between investing in Qualified Opportunity Zone Stock and Qualified Opportunity Zone Business Property? The operative word here is “tangible.” Qualified Opportunity Zone Business Property (“QOZBP”) is defined as “tangible property used in a trade or business.” A business’ “tangible property” is broken into two categories. Tangible “personal property” is that which can be physically relocated, such as furniture, equipment or vehicles. Tangible “real property” – what we know as real estate – refers to buildings or land, which can’t be moved. If your QOF is investing in QOZBP, it might be investing directly in a building or equipment. However, if that fund is buying stock in a company in the Quality Opportunity Zone, it is providing equity directly to the company and would be considered QOZS. Like any other QOZ investment, the equity must be invested in a company that is located in the QOZ and generates “at least 50% of its total gross income is derived from the active conduct of such trade or business”. Buying stock in a Qualified Opportunity Zone Business is one of three ways in which a Qualified Opportunity Fund can put your capital gains to work, while allowing you to defer taxes. Knowing how such funds operate can help you select the best one to suit your particular investment needs.